Growing up with a mom who baked a lot meant that chocolate chip cookies were always on-hand. Whether we were sick, upset, hurt, having friends over or just because we wanted cookies, we could always count on her to make them. Now, this spoiled me rotten and I have a really hard time buying chocolate chip cookies, mostly because I don’t see the need in buying cookies when I can just call my mom to make me some, and also because I know they won’t taste as good. Now that I’m going to be a mom, I decided it was time to learn the classic. Luckily, I have some years to work on perfecting my skill before Cecilia is old enough to have any. But since it’s Christmas time and I’m getting in the spirit, I decided it was the perfect time to give it a go! Instead of calling my mom for her recipe, I looked up cookie recipes on my Epicurious app on my phone, and found this one. The recipe yielded about 48 cookies, but I only got 30 cookies out of it. Keep in mind, my cookies were probably a lot bigger than what the recipe called for. Since I only have one cookie sheet, I did 2 batches of 12 cookies and then 1 batch of 6 bigger cookies. My first batch came out crispy and skinny. I didn’t let them cool off enough so some of them broke but they were very good. Not “mom good” but good. The 2nd batch was a little better but I would go ahead and say that the last batch was my favorite. I was raised on big, thick cookies and that’s what I got! Next time, I will try adding coconut and walnuts like my mom does but it was definitely a good start. Two of my favorite things in the world are peanut butter and chocolate. Separately, they are amazing. Together, they are pure bliss. So, when I saw a recipe for Double Chocolate Peanut Butter Cupcakes, I knew I had to give it a try. It was suggested that you get a pastry bag for the filling and plunge it into the cupcakes. Well, I didn’t have a pastry bag and all of my cupcakes pretty much fell apart, so that wasn’t really an option. So, I opted to use the filling as the topping and to nix the topping completely. Now, they didn’t come out as pretty as they did on the website, but they served their purpose and are still very tasty. But then again, anything that involves chocolate and peanut butter usually is. Anyone have suggestions for keeping the brownies together, and for inserting the filling without a pastry bag? Well, it’s now less than a week until our due date. And needless to say, I have not been very proactive with my 14 week challenge. Like at all. With that said, we did finally get Cecilia’s room ready for her! After getting all the gifts from her baby shower and going through the stuff that was already in her room from when we used it as storage, I was able to get everything organized and decorated! It feels so nice to know that I won’t have to worry about that once she’s here. I was also able to organize our kitchen and my craft closet better and I went through all my clothes and donated a majority of them to Goodwill. It is definitely true that a clean house equals a clean mind, for the most part. The best part of this challenge has been that it has gotten me to cook and bake a lot more. Before I moved in with my boyfriend and started this new chapter of my life, I cooked out of pure necessity and never baked. Now, I bake almost every day, which works out well because I’m craving sweets like nobody’s business! Hopefully after Cecilia is 6 months old, I can get back to crafting and challenging myself more, but I’m definitely going to use all the time I can to cuddle my lovebug! One of the MANY good things about having a friend who got pregnant before you is that you get a lot of their hand-me-downs. For instance, one of my best friends Kandyce got pregnant a few months before I did and she has been amazing. She gives me all sorts of advice and gives me stuff that didn’t work for her baby or her but might work for me and my baby. One of the many hand-me-downs I got from her was this yoga video. I just started it today and only did it for 20 minutes but even that small amount of time really helped. The video has 2 women, one who is full-on pregnant (for those of us in our 2nd and 3rd trimesters) and then a woman who isn’t pregnant (for people who actually plan their pregnancy and are preparing for it; are in their first trimester; just had their baby). I gotta say, once I was done, my body felt a lot better and I have been in a good mood ever since. I’m not sure I will be able to do it for more than a 1/2 hour at a time but even that little bit helps out a lot. The moral of this story: if you find yourself pregnant, find a pregnant friend with a prenatal yoga video or get your own! I wish I would have started this sooner. Last week was kind of a baking extravaganza at my house. I happened upon Babble: Food after someone posted a link from them on Facebook. Since then, I have become quite addicted. As I mentioned before, I love anything pumpkin. 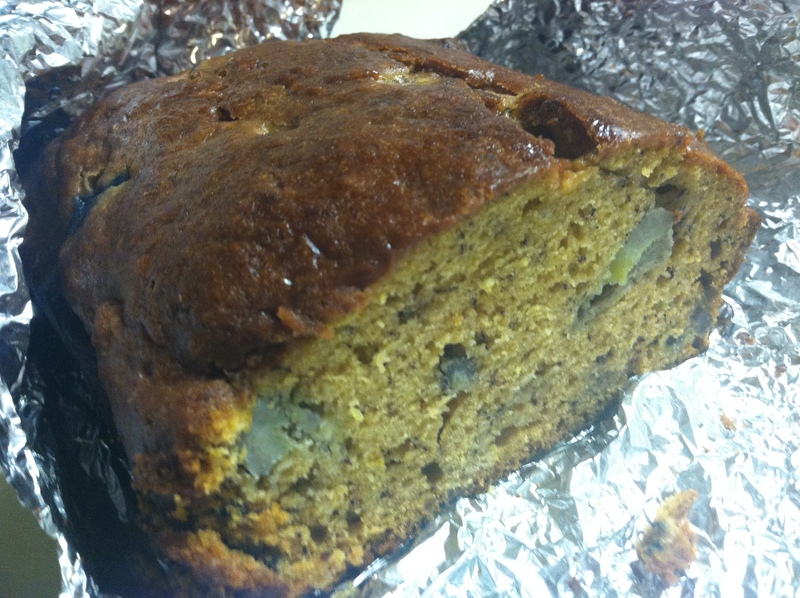 So when I found this recipe for banana pumpkin bread, I had to try it. 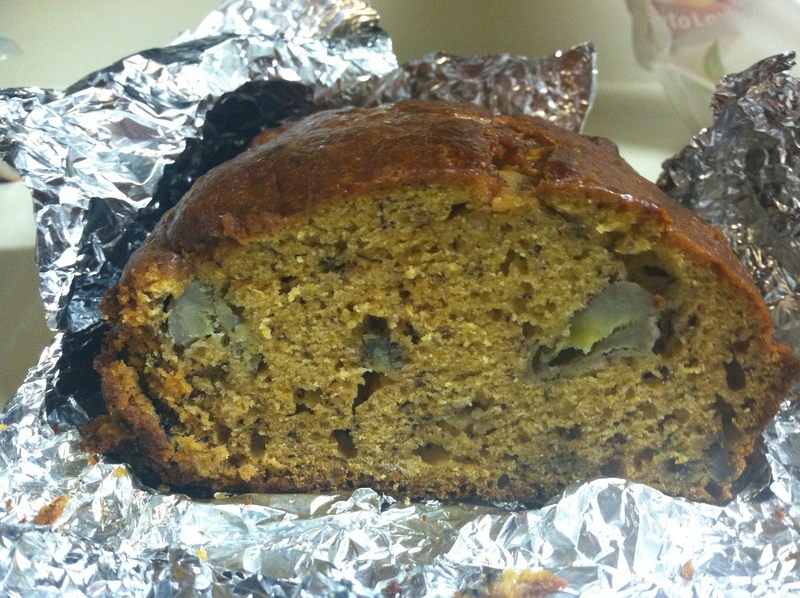 The recipe worked really good, they suggested adding a handful of walnuts, raisins, chocolate chips, blueberries, etc. I went with blueberries and they definitely added a kick! The bread was super moist and wonderful. Everyone who tried it really liked it, which is why I was a little surprised (and hurt), that whoever broke into our car in Chico over the weekend, opened the bread I packed but clearly did not want any. They took our old soft drinks, but no bread. Oh well, we’re going to the beach this weekend and I will be bringing my bread for people who deserve it! 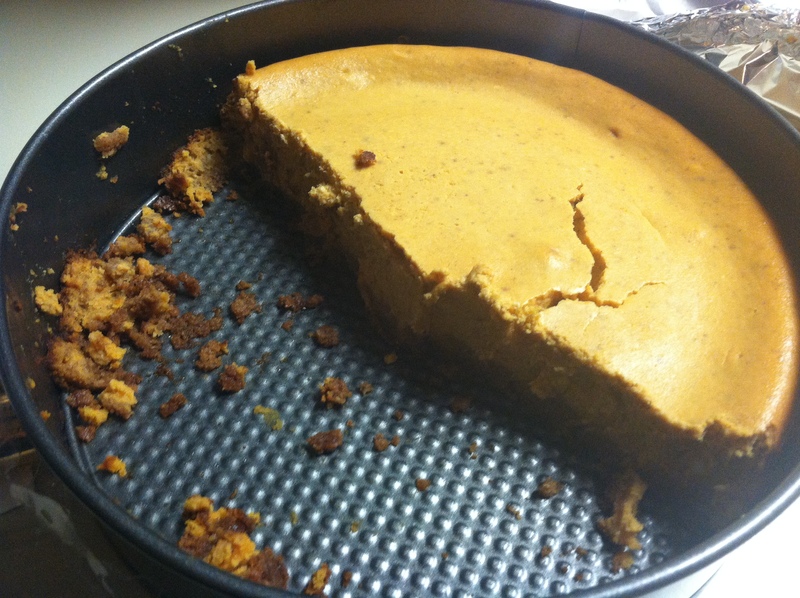 Since the only pumpkin-themed food my boyfriend will eat is pumpkin cheesecake, and I happen to adore both pumpkin and cheesecake, I thought this would be perfect to make. So I tried it out, and it surprisingly turned out really good! I found the recipe on Food.com (another favorite site of mine). My mom already asked if I could make it for Thanksgiving. Now that my family knows I can cook and bake, I can’t keep the “I can’t do anything” act going.